Like many camera buffs, I've done a fair amount of street photography, stalking subjects in markets, parks and tourist areas. Unfortunately, I often come away with little to show for it. That's particularly frustrating, because I live in Paris on a beautiful street with endlessly interesting subjects and settings. My challenges with the genre -- poor ideas, a fear of confrontation and technical challenges -- certainly apply to other types of photography. However, they're magnified on the streets, due to the improvisational nature and factors out of my control, like subjects, lighting conditions and weather. To get better at this most difficult genre, I enlisted Valérie Jardin, a practicing street photographer who has taught the skill to many others in her workshops across Europe and the US. She has strong ideas about how to shoot (spoiler: it's about storytelling) and loves conveying her passion to others. "What's so attractive about street photography is knowing that you have a shot that nobody else has, and that nobody else ever will -- that to me is beautiful," she said. The first step to improving is to drastically raise your standards, according to Jardin. "There's a lot of mediocre street photography out there," she said. "There has to be a story, there has to be something really special to make it a great photo. And that's extremely difficult to see and to capture." What makes a good photo? "It's about emotion. It's not about technical perfection. Because I see a lot of technically perfect, very boring pictures," she said. "There has to be a gesture or something really special." Even when you don't have a camera, you should try to see potentially interesting photos in your mind's eye. "Notice the quality and quantity of light around you, notice the right gesture, and if you had your camera at that moment, when would be a good time to press the shutter button?" As for style, there are a lot of ways to do it. "You can be very minimalist, where it's more about the background and architecture," said Jardin. "Others prefer to be up close and really get in people's faces, and some people prefer doing street portraits where you actually have an interaction. You can also shoot much more anonymously where the subject is not recognizable. So there is a type of street photography that will fit one personality more than another." Jardin leans toward the unobtrusive style. "I don't like to be in people's faces to get a reaction. That is just not my personality, and I would not want a photographer to do that to me either," she said. "You can also do beautiful, artsy street photography while not revealing the identity of your subject at all. So that's another way to do it." "That's really important, the use of a fixed lens," said Jardin. "You're much faster with a fixed lens than a zoom. The better you know your focal length, the faster you're going to be at framing properly. And it's really all about working fast." It's also about knowing your equipment and setting it up ahead of time. Many photographers swear by manual settings, but not Jardin. "Let the camera do a lot of the work. I find that I shoot mostly with aperture priority. I set my shutter speed," she explained. "On an average day, when I want to freeze motion, I will tell my camera, don't go underneath 1/200th of a second." If the lighting changes or is challenging, Jardin will usually use the exposure compensation dial rather than manual mode. The extremely light-sensitive sensors of modern digital cameras are another boon to street photographers. "Just bring the ISO up as needed to stay at that speed," she said. "With today's cameras, I don't have noise when I'm at ISO 6400, and a lot of the time, I need to be. Because I'm indoors, I'm in cafes, I'm in dark places." Silent shooting is another very useful modern feature that Jardin employs. "It's not to be sneaky. It's that if the person notices you taking the picture, then the moment is gone, so there's no picture anyway. It's really about not disrupting what you saw and what caught your eye in the first place." As is autofocus. "You have to work so fast that if you have to worry about focus, you're going to miss the shot." Of course, you have to master your equipment before shooting. "You have to control your camera, but that's pretty easy. Anyone can learn the technical parts of photography," according to Jardin. "I never have to think about the camera, and that's really important, because if it gets in the way, you've already lost the shot." Beginners can make things easy for themselves by selecting the right locations and lighting conditions. Shoot in busy areas, so you'll blend in with tourists taking pictures, for instance. You can also choose spots you know have interesting backdrops with dramatic angles, interesting lighting or saturated colors. "There are times where you go 'fishing,' rather than 'hunting,'" she said. "Where you will find a great backdrop, and you know what time the light will be dramatic at that spot, and then you just wait for the right subject." Hunting, on the other hand, is just walking and looking for something interesting, then trying to capture it. There are tricks to reducing your visibility. Jardin recommends shooting using the rear display rather than the electronic viewfinder. She often shoots "from the hip," stealing minimal glances at the rear display or not looking at all. That's why using the same angle of view is key. "Because I know my camera, because I know my focal lengths so well, I don't need to look at the LCD," she explained. "I can pretty much shoot blind and get my subject in the frame pretty accurately." If possible, wear sunglasses so people can't see where you're looking. A clever trick is to act like you're shooting above or around your subjects, then pretend to "chimp," or review the photos while the camera is pointed at them. That's when you actually take the photo (in silent mode, of course), with your subject none the wiser. If you're sitting right next to someone in a cafe, for instance, pretend to be texting while holding the camera in the other hand. Then, you discretely snap the shot. You can also use your smartphone to control the camera, if it has that function. The silent shutter and sunglasses help with these techniques. Again, you're not trying to be sneaky; you're simply trying to capture a scene without disturbing it. These techniques take practice, so don't expect to get them right the first time. If someone does notice and asks if you just took a photo, Jardin doesn't get defensive, but just explains what she's doing. "I'll just say, 'I'm documenting life in the streets of Paris,' or New York or wherever I am, and then because I can actually show them the picture on the back of the camera, I do, and I said, 'Look, the light was so beautiful, or look how beautiful the silhouette of you walking away.'" If you'd rather take non-candid portraits, then you might have to polish your social skills. Jardin recommends first chatting with folks before brandishing a camera, then asking for a photo once they're more comfortable with you. Time of day is key as well. You're more likely to get beautiful photos in the morning and evening, when the sun is warmer and more dramatic. "There is no bad light. There is easy light and there is hard light," said Jardin. "So if you're shooting in the morning and evening, it's easy. If you shoot at noon, it's going to be a little harder. But it's not impossible. You just have to find those right subjects to fit that light." Finally, you need to change your mindset to be very picky about what makes a good shot. "If you come home with one shot you're really happy with, that's actually excellent. And that's one thing I always remind my students, that it's not going to be like anything else they've ever tried before," Jardin said. "In a year, if you get four pictures that are worth printing, that's actually pretty good." Early on, Jardin told me, "I'm not going to ask lovers to kiss again because I missed the moment." By chance, that very opportunity came up when we were strolling outside the immense castle in Caen's city center and came across a young couple. There, she put all her skills into action and actually came away with a great shot, despite the extra burden of me following her around. "Before I walked over there, I set my camera at f/5.6 ... everything will be in focus at 5.6 on a crop-sensor camera," she said. "So I got in front of this young couple, and once I got there I actually saw that there were two garbage cans in my shot. So I set myself a little differently, just one step to the left, and then I looked like I was actually admiring the castle and I positioned my camera like this [with the couple in front of the garbage cans], and I got one shot there on the grass, with the castle behind them." In fact, Jardin did it so smoothly that I didn't even notice her taking the picture. It was only when I reviewed the video I took that I saw it. (Yes, I was filming her and she still got the shot.) She employed a few tricks, like pretending to shoot above them, then shooting from the hip and just stealing a quick glance at the viewfinder. This photo, taken quickly under difficult circumstances, was better than just about any street photo I've every shot. Seeing this, a lot of pieces suddenly fell into place for me. Using automatic settings and autofocus is a must with this style, as it's impossible to change settings on the fly. You also need to have the camera set the way you want, then let it do its job. Once you pick the aperture and set the autofocus how you want (face detect can be handy here), you're ready to go. Most amateurs try to rush, so they don't notice things that might detract from the shot, like those garbage cans. A lot of my street shots had cluttered backgrounds that distracted from the subject. I could have improved those photos considerably just by moving a few paces left or right. "Most people don't even realize you're taking pictures, so you can get pretty close." It's not easy to shoot from the hip and get the framing right, but it just takes practice -- and you can do that anywhere, even without human subjects. You also need a lens or camera with a fixed focal length or, if you're using a zoom, to set it the same every time. Then, you've got to know when to press the shutter button, and do it in a way that's not obvious. Again, this just takes practice. 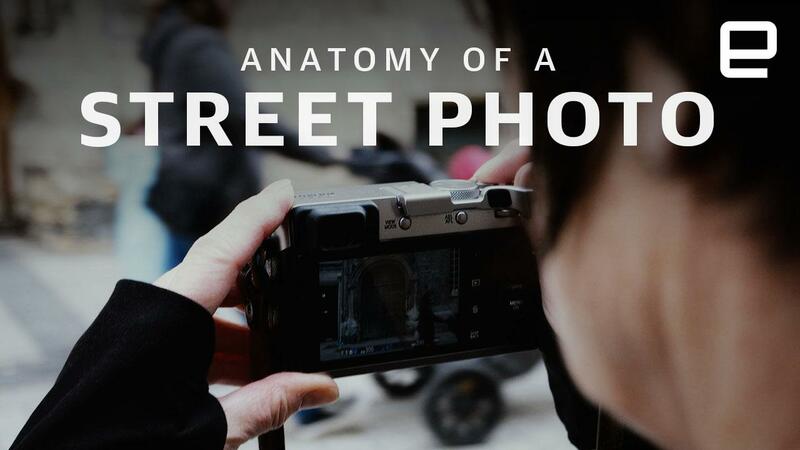 All of these techniques will help you get closer to your subject, which is key, as any street photographer will tell you. "Most people don't even realize you're taking pictures, so you can get pretty close," said Jardin. Finally, you can't be afraid to fail. "You'll miss a lot of shots when you shoot from the hip," she added. "That's part of the game. If you come home with one shot you're pretty happy with in a day of shooting, that's street photography and you should be pretty happy with that. You're not going to go home with 20 great shots after a day of shooting. If you do, then the bar is too low." Jardin, like many street photographers, prefers to get as much in-camera as possible. "I make the decision of color and black-and-white in camera, because that's part of the process and that's very important. You should always know before you click the shutter whether it's going to be in color or black-and-white. Even people who shoot RAW should make that decision before they click the shutter." Suffice to say, she finds photo processing tools like Adobe's Lightroom to be a crutch. "I have the five-second rule. If a picture takes more than five seconds, it's gone. I don't even shoot RAW anymore," Jardin told me. "First, because I've been shooting Fujifilm and I can't replicate their film simulations with Adobe [Lightroom]. And it's really part of the creative process to make the decision in camera. I'm going to make the decision: It's going to be in Acros or in classic Chrome if it's in color. And both of those decisions I make before I press the shutter. "And I never even think about having those tools in post-processing. To shoot as if it has to come out of the camera as-is. Yes, it's great to have the crop tool, or to straighten some verticals, but again, that will take seconds, if needed. I never go with the intent of cropping, I may straighten it, I may crop slightly if I can't get any closer, but again the goal is to get the shot in camera." If all of this sounds challenging, well, that's the idea. But if you approach it as an adventure rather than some kind of chore, you're bound to have more fun. "I like to let the streets surprise me. There is a story everywhere, there is a story at every street corner, you just have to see it. It's like a treasure hunt for me. And that's why, if I come home empty, that's okay for me. It's about the experience." And when you do capture Cartier-Bresson's so-called decisive moment, there's no better rush, and the reflexes you develop will make you a better photographer overall. "There are all sorts of things that come into play in that fraction of a second," said Jardin. "Like, the use of lines, the use of repeated pattern, the position of the subject. It's not like you're setting up some tripod and waiting for the light when shooting a landscape. Here, you only have time to react, because you're immortalizing something that's never happened before and will never happen again. No one can replicate it, you can't replicate it, and it only takes a fraction of a second." Images: Steve Dent (Jardin portraits); All other photography copyright and used with permission of Valérie Jardin. Follow Valérie Jardin on Instagram, Facebook and Twitter.